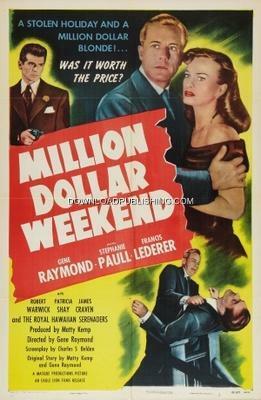 Nicholas Lawrence (Gene Raymond), the owner of a large financial company steals the Company Assets consisting of a Million Dollars in Cash and Bonds. He books a flight to Shanghai, China with a stop-over in Honolulu, Hawaii. Cynthia Strong (Stephanie Paull), is on the same flight, shes running away after killing her husband and is being harassed by Blackmailer Alan Marker (Francis Lederer), who saw her do it. She asks Mr. Lawrence, who just happens to be sitting near her, to act like he knows her, so Mr. Marker will leave her alone. He agrees and gets mixed up with the two. They lay-over in Honolulu for a couple of days, during this time Mr. Lawrence has second thoughts of stealing the money, but its to late, someone has stolen it from him. Now he only has until Monday Morning to find it and get it back.